2012 was a pretty big year. I could write exhaustively on all of the groundbreaking news that happened in those 12 months, but that would not be very interesting to read (nor would it to write). Instead, I'd like to focus on a few ways 2012 proved that the End Times weren't upon us. All that nonsense with the Mayan apocalypse was just kind of silly, anyway. 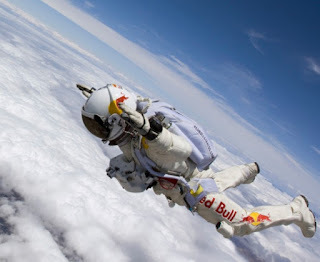 Red Bull and their Stratos Space Jump, performed by Felix Baumgartner. Maybe people will start associating energy drinks with space travel instead of Tang? NASA's Mars rover,Curiousity, which is still on the red planet now. I don't think they'll find aliens there, but if the movie John Carter was any indication, the rocks are probably the most interesting thing there anyway. The most interesting to me, though, had to be when SpaceX successfully completed the first commercial cargo delivery to the International Space Station. I'm ready for more businesses out in space, but I wonder what the advertising will be like? There were some incredibly interesting steps made in computing and robotics that made the future look more like the one in Star Trek than a future where John Cusack gets in car chases with earthquakes (I apologize for another bad movie reference. It was a much better year for science and technology than it was for hollywood). Google dominated the news when it revealed two major projects, Google Glasses and their self-driving cars. These both seemed like science fiction, but when the company showed the work they had put into it, there were fewer skeptics and at least a few people thinking, "well, Google can definitely drive better than some of the people on the roads today" and some worried about the state of fashion when everyone is wearing glasses with computers built in. 2012: The year where we (hopefully) saw the functional differences between astronomy and astrology.